Sleep tight America... These women carry guns. 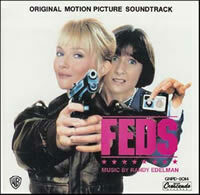 GNP Cresendo presents the original soundtrack to Daniel Goldberg's 1988 comedy FEDS starring Rebecca De Mornay, Mary Gross and Fred Dalton Thompson featuring music by Randy Edelman. Ellie DeWitt and Janis Zuckermann are admitted to the very strict FBI Training Academy. They get a hard course, in which they learn to deal with guns and to recognise crimes. They also get a physical training. It appears that Ellie is a real fighting- machine, in contrast with Janis, the great student. They have to help each other, 'cause only when they pass all the tests, they are allowed to join the FBI.